You've probably seen this idea. I'e seen it a few different places. 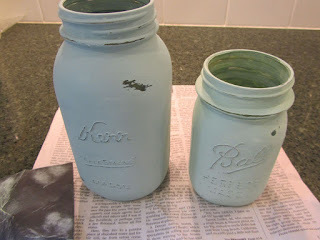 And I've seen the canning jars painted on the inside as well as outside. When painted on the inside, the jars retain that glossy, glass look. When painted on the outside, with a matte paint, they look more vintage. Anyways, I thought I'd give this project a try. I love its rustic look, which seems to be a natural for autumn decor. And it's so easy, and inexpensive. I just used what I had on hand. I set up a spot on my kitchen counter, off to the side, with a half sheet of newspaper folded over as my work area. 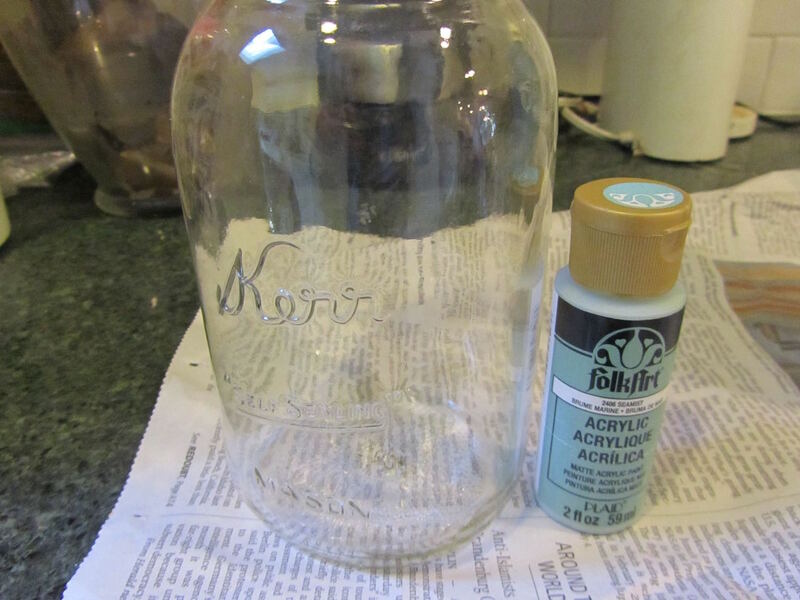 Optional final step -- you can spray your finished jar with a matte, clear acrylic spray, especially helpful if you will be using this jar for holding anything wet, like fresh flowers, or the jar will be placed outdoors, where it will be exposed to moisture. I skipped this step, as I didn't think it was necessary, and would cost extra money for the sealer. This was a totally easy project. Took about 40 minutes, total hands-on time. I was able to set-up a work area in less than a 24-inch section of kitchen counter. And it cost me absolutely nothing, up-front. 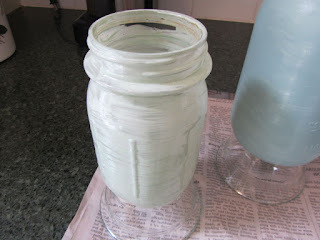 I made 2 jars, using 2 shades of acrylic paint that I already had. I love creating and crafting. So this filled that need. I had a bouquet of autumn toned silk flowers for the larger jar. And for the smaller jar, I made a bouquet of twigs and dried leaves. What do you think? I like the rustic look. And I love the paint colors, otherwise I wouldn't have had them on hand to begin with. I have a super huge confession to make -- I sometimes buy those small vials of craft paint, simply because I love the color. I tell myself that I'll do this or that project, but I often don't. I just really love the color and so I have to have an excuse to buy the paint. At 79 cents or less a pop, I figure it's a cheap thrill for me. It's like women who have oodles of lipstick tubes in their cosmetic drawer, or a gazillion pair of shoes, 50-million pairs of colorful socks. We buy and collect them simply because we've fallen in love with seeing them, as individual pieces and en masse in a drawer or cupboard. And I do eventually find a project to use my little splurges on. So it's all a win! Before I even had money to buy the paint, I used to collect paint chips from the paint section of Home Depot. Not necessarily colors that I'd paint a room in my house, but just colors that I liked. I just like colors, I guess. So, how about you? What kind of fall decor projects have you seen, on pinterest, websites, blogs or whereever, that you've wanted to try, yourself? Any super frugal ones, that you already have the materials for? 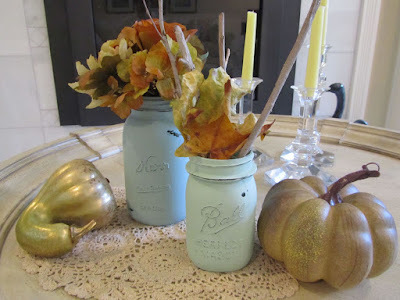 If you feel in the mood to share your own fall decor, and would like, you can email me photos, and I can do a post later this week or next showing off your autumn decor style. Email to lili.mounce at gmail.com Thanks! I'd love, love, love to see some of the decor in your home! It gives me inspiration. We have a scarecrow on our back porch that we found while trash picking one day. I'll see if I can get a photo of it soon. I love that you love getting the paint for 79¢. At times It makes me feel good to buy something that I enjoy, especially when I've been doing so well not spending for a long time. I've been busy cleaning this week. I cleaned out a freezer and washed my older car and hosed down the back porch and those things make me feel good too. I love to sit back and look at things all clean and shiny. I love to look at a freshly mowed lawn too. oh, that scarecrow must be a wonderful fall addition to your porch! I would love to see a photo of it! You've been very busy, indeed! Good job on all of that needed work. And I agree, it is vey nice to sit back and see how fresh your home and belongings look after a good cleaning. It really does make a difference! Cheapest home make over ever is a good cleaning. 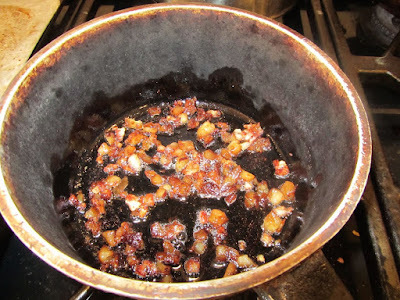 When you get to it, if you wind up doing this, send me a picture, so I can see how your idea panned out!! I hope your week is off to a wonderful beginning, Lisa! One day, I would like to chalk paint our kitchen cabinets a particular dark green. I have an old pocket book sitting on our bookshelf that is the perfect color, so I am going to use that as a swatch when I am ready. The problem is I am very conservative with using colors, I stick with neutrals so much, that now everything is so very bland and uninteresting. But I am scared to take that leap, and always talk myself out of doing it just yet. Also I don't want to spend a lot of money on a kitchen remodel and paint is the cheapest bang for the buck. It would anchor the green entry tiles that seem to be a bit too bold for the rest of the house. It's interesting that you love to see color, but choose neutrals to wear. I am the opposite. I tend to wear colors but prefer to see neutrals and natural colors. I recall learning something about the meaning of this, something to do with introversion/extroversion but can't quite remember it all. Something about if you are introverted, you don't mind the competition with color in what you wear. I know it was counterintuitive. I don't have any home decor items worthy to show. Not even my rag rugs. Still not happy with the results. Have a nice, beautiful day!! Interesting bit about introversion/extroversion and color choices. I don't know what I am, maybe more of an introvert, but as a child, definitely more of an extrovert. So, who I am now happened somewhere in between, and maybe isn't my "true" personna. But I wear neutral colors in large part because I don't like to be noticed. I love color, however. With your cabinets, that sounds really interesting. It's had to take that leap, though, isn't it? Maybe you could choose a smaller project to get you started and see if this is indeed what you want. Would you use the chalk paint surface for chalk messages? Maybe a bulletin board/message center on one cabinet front near a phone or doorway, or a cabinet that stands alone, more from the rest. Or even a framed piece of board, in an ordinary stand-up frame, on the counter, for messages on the chalk paint. Sounds interesting, and a fun project sometime! have a great day, YHF! Thanks, that is a good idea, to start with a small chalk paint project since I am new to this paint technique as well. I could buy a wooden stool and paint that first to see if it is the right color for the kitchen. We could make some crates on wheels and paint that also. Wonderful idea, thank you!! Oh, both of those are great ideas. Sometimes, when I just can't get myself to begin a project, I do something small using the same technique, just to get my foot in the door, so to speak. It works for me. Kinda like "fooling" myself into cleaning out a cupboard. I tell myself I'll just do the top shelf. And before I know it, I've done the whole thing! I really like the jars, Lili, and have thought of doing that same project before, so maybe now I will be inspired to do it. Blues and greens are my favorite colors, so those are the colors all through my home. Blues and greens give me a feeling of peace and tranquility. I imagine your entire home is one of calm and peace. Looks like a fun project. They turned out really nice. blue. It is a very healthy color to live with. Earth tone are also healthy. If you can, please send me a photo when your daughter gets finished. They sound beautiful! I inherited my parents' 1967 dining room set and I've wanted to make it my own in some way. 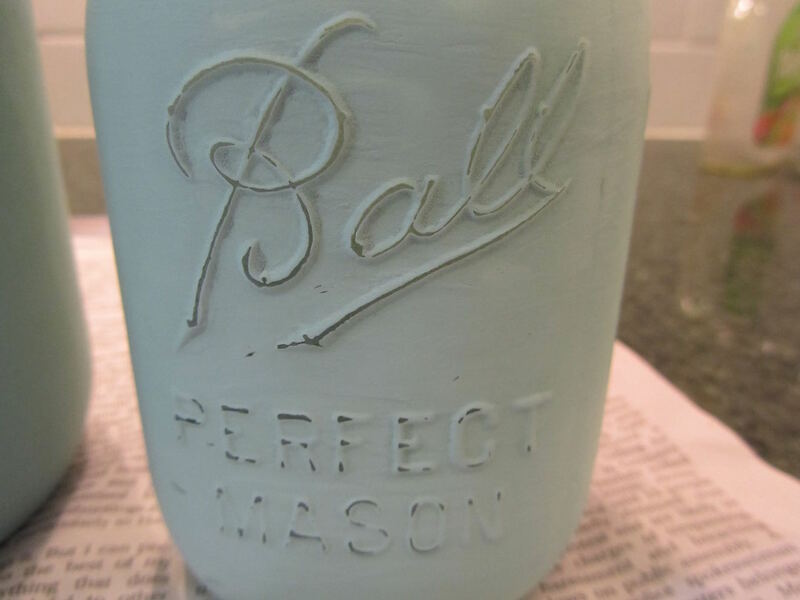 A milk paint sounds beautiful! I agree on how soothing blue can be! I'm sad because I don't like crafty anything. I don't decorate anything either. It would just be something else for the cat's to knock over and hubby would call it clutter and my son would go nuts if he saw anything crafty! In elementary school he also disliked art class. He never took an art class again that wasn't required. 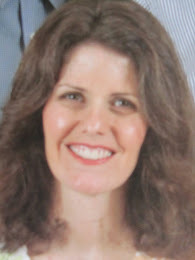 My youngest daughter is an art history/archaeology/classics/classical languages major and minor. Not sure what it all means but she's doing it. I'll just leave all the "art" outside and just enjoy looking at it! I think it's totally fine to not be into something that everyone else seems to be. With me, that's Star Wars anything. I'm just not into it, yet my family really enjoys those movies. Just not my thing. I get the cat knocking things over. Live and learn, here, has mentioned that quite a lot with her cats. And I remember life with cat in the house. Every.single,thing was fair game to be knocked off a counter or shelf. It sounds like your daughter is an art appreciator. So whatever you did with your kids growing up, it allowed her to follow her own path. Good job! Yep, our cats bring a lot of joy and fun, but they definitely limit our decorating choices. I looked at something similar on Pinterest but wasn't sure it was something I could do . Your directions make it very doable . Love the fall colors and bet they would look stunning in a Christmas theme . truly, you can do this. It was very easy! You and Lisa are giving me Christmas ideas with these, now. 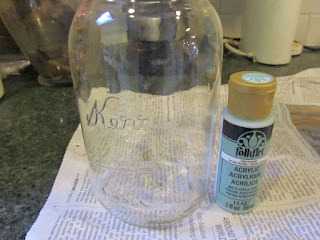 I'm thinking something to go in the jars in silver and white -- bare branches, spray painted white, with something silvery. Just my mind racing ahead a holiday or two!! Have a great day, Dee!